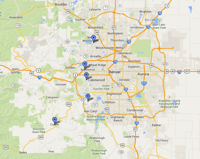 Since 1983, the Colorado Taekwondo Institute (CTI) has been teaching Moo Sul Kwan Martial Arts in Colorado. Certified by the American Martial Arts Sports and Education Association (AMASEA), our students are provided with the best martial arts instruction available. 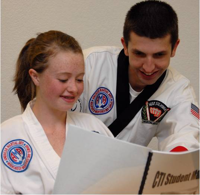 Our passion at the CTI is to develop students who will become dynamic black belts. We also develop our students' and instructors' leadership and teaching skills, enabling all of us to make meaningful contributions to the family, school and community levels. People ask us all the time, "Is my son/daughter too young to start classes?" The answer of course is, "No way!" Students of all ages will benefit from learning form our martial arts school. Students of this age group will actually get an incredible education! The habits students develop at this age will stick with them their whole lives. 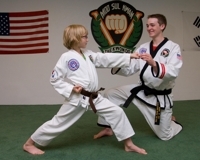 Martial arts classes are excellent in developing a child's self-esteem and confidence. Our program will help your child their confidence and self-esteem, making them unstoppable! Martial Arts are designed to train the body as well as the mind. It teaches them how to study. This will translate into their school work. Students have stronger school grades when they are consistently involved in class! Respect is a very important concept we teach in our kids Taekwondo classes. We teach our students to not only respect teachers, parents, and grandparents, but to respect everyone. This respect for self and others will have a profound impact on their daily lives. Our martial arts school's mission is to teach and encourage world-class leaders. We are creating future leaders, one black belt at a time. As a student is working on earning their black belt, they are also becoming a leader in every aspect of their life, including school, home and other activities. According to fitness.gov the childhood obesity rates for children ages 6 to 11 have quadrupled in the past forty years. It also goes on to say that "children now spend more than seven and a half hours a day in front of a screen." Our dynamic kids taekwondo classes keep your children moving, teach them the importance of exercise and keep them in shape for a bright future. Two Introductory Classes - Come try two CTI classes, including a private introductory with a certified black belt instructor. These classes are designed to introduce you and your child to the school, and give you the opportunity to get a feel for our classes. A Private Consultation - After the two introductory classes, you can sit down with a black belt instructor and discuss program options that will best suit you and your family. FREE CTI Uniform - Receive an official CTI uniform with this introductory special (a $35 value). Our introductory program is designed for you to see results in a very short time. By the end of the two classes, you will be impressed with the results you will see in your child! 1. Pick up the phone and call 303-428-5377. We'll answer any additional questions that you may have and schedule a special time for a black belt instructor to work with you and your child. 2. Register Here online. Simply fill out a few simple questions and the campus coordinator from the appropriate campus will contact you shortly. We look forward to hearing from you soon and providing you and your children the very best in positive, educational experience! ©2019 Colorado Taekwondo Institute / SportsEngine. All Rights Reserved.